She might not always need to dress in shimmering metallics and dazzling sequins, but when she does there's this collection from Charabia. The Parisian brand captures the elegance and whimsy of classic French style and translates it perfectly for budding fashionistas. Ruffled party dresses here. Swingy lace skirts there. She's certain to love them all. Now, if only they came in our size too. 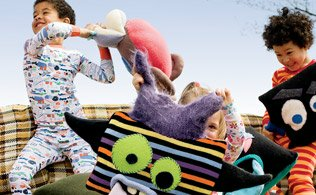 Well play they will – with this Kreechers collection that blurs the lines between pillow, toy, and buddy. These zany characters will delight your little ones’ senses, and also be around to cuddle when it’s time for a nap. We can't think of anything sweeter than tiny sneakers. Sporty velcro straps. Glittery accents. Floral prints. Why aren't grown-up shoes ever as much fun? This collection from Spanish brand Pablosky features a number of winning styles to covet. From metallic Mary-Janes to "LOVE" emblazoned lace-ups, casual never looked this cute.